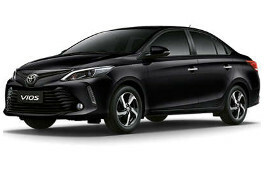 Correct Wheel Sizes, PCD, Offset, Rims and Tire specs for Toyota Vios series. Hi,Gary,No,it can't fit for.the diameter of new tires out of the normal tolerance. 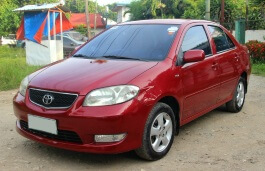 Hi, i need your advice what do you think is the best rims for vios (2005).? Hi,Pal,No,205/45/17 is not compatible according to the tire calculator. 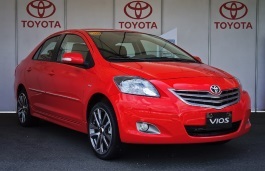 is there a rim and tire size 205/55/R17 that will fit my Toyota Vios? Hi,Jom,205/55/17 is not compatible for your car. Hi, my current tyres/ream size is 14", i intend to upgrade to 15" is it possible? Hi can I replace my vios 2014 1.3 with size 16 rims? Hi,Upsize,You can try 15*5,ET 39, bolt pattern 4*100. Can my Vios 2008 fit into tyre size 195/55R/15? My current rim size is 15". Will there be any complication? Hi,KHOR HOCK LAI,Yes,195/55/15 is compatible for your car. Is 195/55R15 tyre suitable for toyota vios 2003 1.5i ? Hi, Wong Kwok Wei,Yes,it can fit for. Hi,Michael,For 18'' mags,You need to confirm the wheel size,offset,bolt pattern..If they are comaptible,It can used for. Hi,Angelo,The tires is compatible.For the wheel size,What the bolt pattern and offset of it? Hi. How about the offset is 32.. I'm planning to upsize my tires from 175/65r14 ET39 to 185/55r15, is this compatible? if yes, what should be the best offset for the upsize? 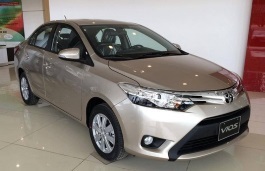 2014 vios 1.3J M/T. Thanks. Hi.. can i use 195/60R15 for my toyota vios 2016?? Hi,Kudus,Can you show your current tire size?It can help to confirm. my current tyre size is 185/60/R15 rim size is 5j. hi, can i replace my stock tire from 185/60 R15 to 185/65 R15, vios 2016? Hi,Hart,Do not suggest that you use 185/65/15,This new tire diameter is little bigger than your current stock tire.It may cause some uncompatible. hi,can i replace my stock tires from 185/60r15 to 195/60 r16???. 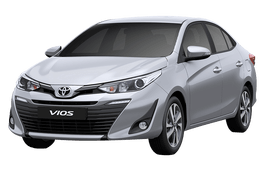 i own a 2016 vios 1.3 e thanks!!!! Hi,neil tumamao,No.it can't fit for. so what combination of mags and tires should i use then and what et? how about 195/55r16 or 195/55r15?!?! Hi,neil tumamao,Both 195/55/16 and 195/55/15 is compatible.You can select one of them to fit for your car.For offset(et),The stock wheel offset is 39mm.for more detail,You can use homepage rims search to find more. Hi,Mai,Yes,these two tires are compatible. Can i replace with ordinary tyres? Let's say 185 R15? Hi, jay guzman,What your current tire size?And 185 R15 is not a complete tire size format,You can try to find format like ***/**/R** . Is rim 15 or 16 fit to toyota vios 1.3E model 2010 sir? Hi,Jordan jesus,Can you show that 16'' rims size detail,I can help you confirm. can i use 195/50R15 to my stock mags vios r15mags? Hi,Mj,What your current tire size?I can help you confirm it. Hi,Mike,What the wheel size of that 14''?You can compare it with vios wheel size. can I change my original Vios 2017 tires 185/60R15 to 195/60R15 using the same wheels R15x5.5 et 45? Hi,Romel,You can use 195/60/15,it is compatible with your current tires. Hi,poleekaye,What your current tire size? Hi, a wahab,Yes,these two tires are compatible. Hi. Good day. My stock wheels are 15x5.5 for vios e 2018. Is 15x7, offet 32, compapatible? Thank you. Hi,Josh,for your car,7'' is too bigger,You can try 15*6.5.And if you use 7'' rims,you also need to change tires.And the wheel stock offset is 45mm,offset 32 is not compatible. hi Romel i am in the same question... however originally my yaris/vios 1.3 is using 175/65R14 and recently i changed the old 14inch steel rims to 15 inch OEM alloys with 195/60R15.. however i sense minor drop in torque... had i known the difference in torque i could have used 195/55R15 however that wasnt available at the time of my upgrade.